Dr. Pescatore makes it his personal mission to bring compassion, knowledge and natural healing to each of his patients at Medicine 369. With over 20 years’ combined experience in the medical field, the staff enjoys getting to know each patient as a unique individual and strives to provide a comforting and painless experience with each visit. Patients leave with a better understanding, and excited about the new choices they will make to walk out the door towards a healthier life. Medicine 369 provides an array of services to have you feeling totally covered for not just you but your family and friends as well! Primary Care: We believe in a holistic approach which includes taking care of the medical/nutritional needs of the entire family. Allergy and Digestive Issues: Many Americans are underdiagnosed and have just suffered living with digestion, bloating, food intolerances, or inflammatory conditions. Let us help you find out the real problem and conquer these issues for good! Children’s Health: We firmly believe that most common childhood illnesses can be treated without the use of potentially harmful medications. You’ll walk out with immediate lifestyle changes for your child before you’re handed a little white slip. Chronic Illness: We understand you probably feel at a loss when it comes to your daily pain, and exhaustion. We feel confident in getting you back on your feet through healthy natural alternatives. NEW! DIV (Direct Intravenous Ozone Therapy: A powerful, natural, and safe treatment alternative to help eradicate diseases. Hormone Balancing: Balanced Hormones are essential for good health in both men and women. We understand life gets in the way and diet and stress certainly plays a part in the fatigue and pain you’re feeling. We will help you get back into balance. IV Therapy: IV therapy treatments allow your body to tolerate doses that you could never take by mouth; and the vitamins get absorbed more readily. Everyone can benefit from IV therapy. We’ve found that once patients try it, they enjoy the effects so much they find it hard to “take” their supplements any other way. NEW! 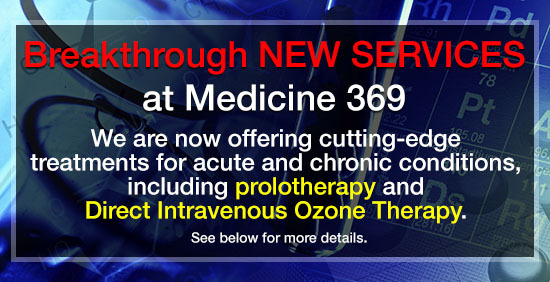 Musculoskeletal conditions, acute & chronic: Medicine 369 is now offering cutting-edge treatments for acute and chronic musculoskeletal conditions without the use of steroids and other toxic medications. Including prolotherapy, prolozone, and PRP. Weight-Related Disorders: Dr. Pescatore along with his staff has more weight loss experience than any other center in New York City. If we can’t get it off you – tell us who can! If you are becoming a new patient, please download, print and complete the following forms before your visit to avoid delays: Patient Registration Forms (pdf). Please note Dr. Pescatore is an out-of-network provider and therefore payment is expected at time of service. As a convenience for our patients, at the time of your visit, we will electronically submit your insurance claim for reimbursement. We are pleased to accept all major credit cards, checks and cash as payment for services rendered. Please call if you have any questions. Medicine 369 is conveniently located on the corner of 41 St. and Lexington, one block south of Grand Central Station. 369 Lexington Ave., 8th Floor, New York, NY 10017 Phone: 212 779-2944 FAX: 212 779-2941. Before you go! Dr. Fred wants to connect with you. Make sure to follow Dr. Fred on Twitter (@drpescatore) and like his page on Facebook (Logical Health Alternatives) to stay up on current health news, daily tips for living healthy and chatting with like minds about healthy success stories every day!